Department of Consultant ENT and Head & Neck Surgeon is headed by Dr. K. Balakrishnan MBBS, MS (ENT), DNB (ENT), FRCS (Glasgow), FRCS (ORL-HNS). 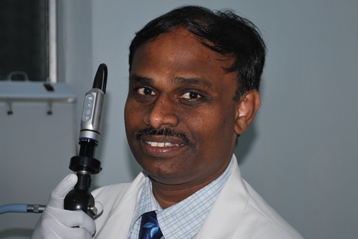 He completed his M.B.B.S from Thanjavur Medical College and MS (ENT) from JIPMER, Pondicherry. following which he did his D.N.B (ENT) National Board of Examinations, New Delhi. FRCS (Otol) Royal College of Surgeons & Physicians of Glasgow, U.K. FRCS (ORL-HNS) Intercollegiate Board of Speciality, London, U.K. Fellowship in Head and Neck Surgery St. George’s University Hospital NHS Trust, London, U.K. He has over 22 years of ENT experience 12 years of which were in United Kingdom.